The SCHI is an integrated, collaborative and comprehensive education, skills training and research facility for health professionals, central to the Sunshine Coast University Hospital’s (SCUH) vision of providing excellent care through collaboration, enquiry and education. Together, the SCHI Foundation Partners provide a range of educational tools and training to develop and improve the skills of doctors, nurses, allied health workers, health professional and vocational students. The SCHI fosters integration, collaboration and teamwork across education, patient care and research and plays a major role in the education of the future healthcare workforce and in up-skilling the existing workforce. Significant growth is expected in numbers of health student and academic staff in the coming years and the SCHI has been designed to facilitate the expansion of learning and research activity as demand requires. Central to the governance model of SCHI is the Joint Venture Agreement, entered into by the four Foundation Partners. 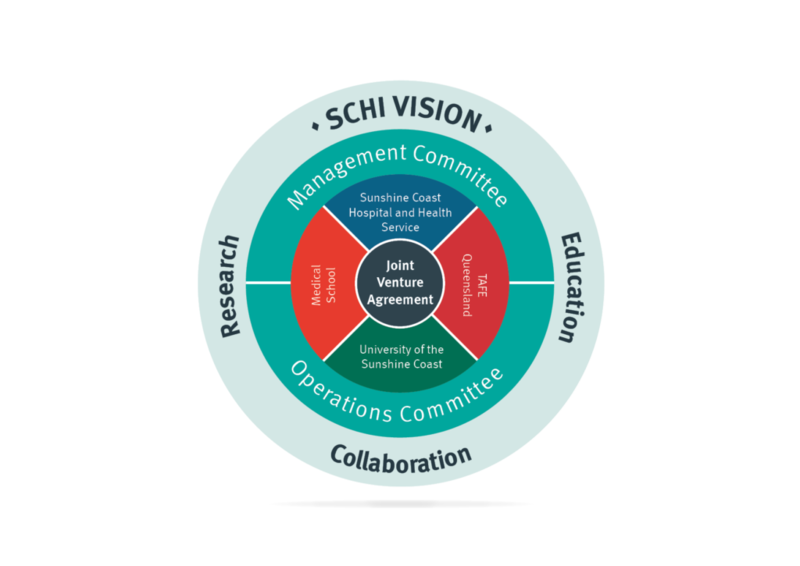 The SCHI Operations Committee and SCHI Management Committee are the main mechanisms that ensure the SCHI is achieving its vision and objectives. Copyright 2019 © Sunshine Coast Health Institute. All rights reserved.